Colombus' voyages to the "New World" were just the beginning of the intermingling of peoples and cultures that formed our nation; this rich and varied history is reflected in the prehistoric and historic sites, buildings, structures, objects and districts found throughout the land. The National Register of Historic Places can guide you through our history with Discover Our Shared Heritage--a series of travel itineraries that explore our country's past through visiting places listed in the National Register of Historic Places which reflect major aspects of American history, such as exploration and settlement and cultural diversity. The first explorers and settlers of the Southwest were American Indians; they gave the vast area much of its distinctive culture and learned how to live in its climate and geography. Some of the earliest and most expansive attempts at colonizing were made by the Spanish. Acoma, San Xavier del Bac, Fort Apache, Mesa Verde, Santa Fe, Hubbell Trading Post, Hovenweep, Kit Carson House, Taos, Barrio Libre, Fort Bowie, Tuzigoot, El Santuario de Chimayo; the names of the American Southwest evoke a starkly beautiful land of deserts, mountains and fertile valleys which is both very old and very new. Arizona and New Mexico, admitted to the Union in 1912, are two of the youngest states in the nation; yet Arizona, New Mexico and Colorado contain venerable adobe communities and ancient, long-abandoned prehistoric ruins collectively representing thousands of years of human habitation. The earliest documented occupation of the American Southwest dates to before 9,000 B.C. While hunting and gathering activities predominated in the Great Basin and California, and bison hunting dominated the Plains, the peoples of the American Southwest established early agricultural communities and grew maize, beans and squash. They constantly experimented with a variety of irrigation techniques to overcome the hot dry climate. Changes in rainfall patterns led to their constructing complex communities which would eventually be abandoned when rainfall could not support the population. 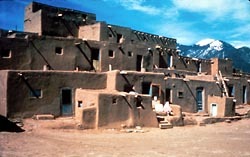 Spanish explorers of the American Southwest, beginning with Coronado's 1540-42 expedition, encountered both settled communities and deserted ruins. 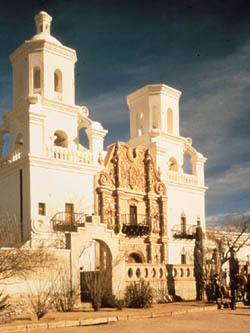 The Spanish, in making the American Southwest an outpost of their far-flung empire, brought change as religious orders, soldiers and colonists built missions, presidios (forts) and towns with distinctive central plazas and churches; Santa Fe was founded c. 1610, Albuquerque in 1706, Las Trampas in 1751, and Taos between 1780 and 1800. After the Southwest was brought into the orbit of the expansionist American nation, the Anglo influence was imprinted on the land in forts, trading posts, mining centers of silver, gold, and copper, cattle ranches, railroads and dams. The American Southwest with its distinctive building traditions, its languages, religions, and foods, reflects the vitality of the Spanish, Mexican, Indian and Anglo cultures which formed its history and the Southwest we see today. This National Register of Historic Places Travel Itinerary will introduce you to prehistoric and historic sites, buildings, structures and districts associated with the long and colorful history of the American Southwest. The itinerary links National Parks with places listed in the National Register that illustrate early periods of Southwestern history. The 58 historic places highlighted in this itinerary can teach us about the contributions of the various people who settled in what became the United States of America. The itinerary includes a map showing the location of these historic places along with a brief description of their importance in our nation's past. Use this guide for locating interesting historic places in conjunction with your travel to our National Parks in the American Southwest. Visitors may be interested in Historic Hotels of America, a program of the National Trust for Historic Preservation, located near some of the places featured in this itinerary. Many of the sites in the American Southwest contain irreplaceable prehistoric and historic artifacts which are protected by Federal and state laws. In keeping with our responsibility to preserve these sites for future generations, visitors should be extremely careful not to disturb or remove any artifact found at these sites. Please visit Vanishing Treasures to learn more about the threats facing these artifacts.